Just a quickie today, a shot taken from some point in space which straddles the borderline of Brooklyn and Queens (although this one is slightly more in Brooklyn) taken from the Greenpoint Avenue Bridge. Apologies for the brevity, but a humble narrator is busy staggering across the boroughs today, and in the midst of preparing for a series of meetings and presentations. Be back tomorrow with something more substantial. It was 150 years ago today, that John Ericsson taught the band to play. Shots from the Greenpoint Monitor Museum parade, held yesterday, celebrating the launch of the USS Monitor 150 years ago today. Not entirely sure what role Llamas played in the Civil War, of course, but their presence was quite welcome. Don’t tell Newtown Creek, as I wouldn’t want her to think that I’m cheating on her- but occasionally, I visit the Gowanus Canal. It’s no tryst I’ll confess to- I’m a one superfund site kind of guy- but I’ve always enjoyed harmless flirting. Witness the Loujaine, therefore, one of the Gowanus Canals permanent guests. Once upon a time, Loujaine was the proud property of “Arabian Bulk Trade” or ABT, and served as a cement and dry cargo ship for the Saudi Arabia based company. That green and white funnel (smokestack) with the running critter in it is their logo. 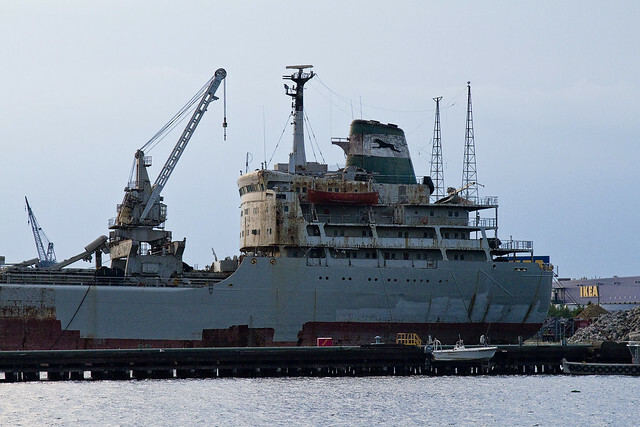 The ship was built in the Nagoya, Japan of 1966, and lost its certification in 1985. 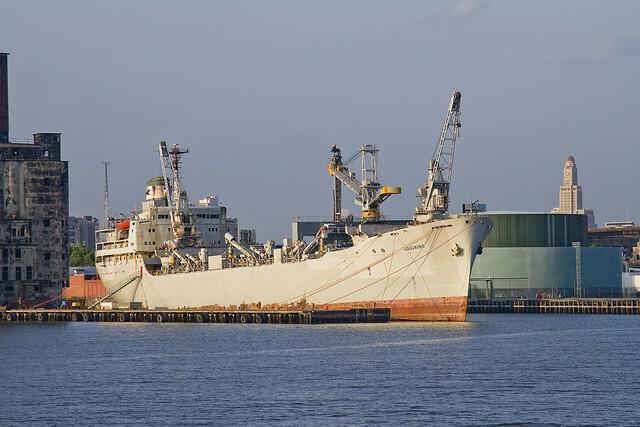 Reliable sources indicate that the ship was originally rigged as a bulk carrier, and that its original name was Bahma. 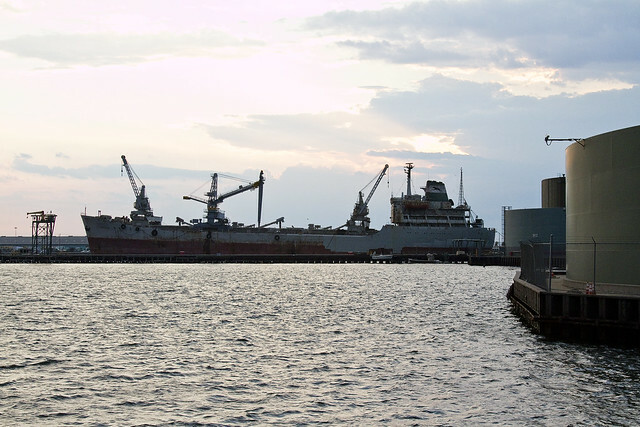 Arabian Bulk Trade was formed in 1977, acquired Bahma in the early 1980’s, and converted the ship for cement handling. They renamed it the “Abu Loujaine”. ABT, incidentally, is part of a larger Saudi company which is called Xenel. Xenel is an enormous conglomerate which dominates several Saudi markets, and is one of the companies operated by the House of Alireza. A mercantile clan, the Alireza are somewhat analogous to the Rockefellers, or so I am told. The fellow who runs Xenel is an accomplished businessman and international statesman. It arrived in Brooklyn (I am told) in 1985. Ownership has changed hands a couple of times since the ABT days, but according to the maritime websites it is currently owned by a local cement company of sizable reputation. 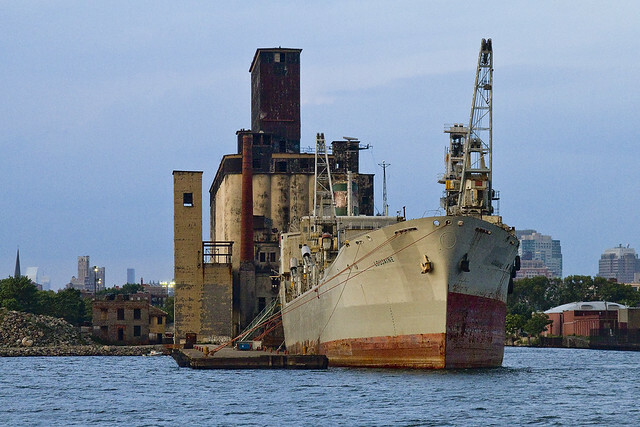 My understanding is that the ship was “decommissioned” and serves as a so called “floating discharge terminal”, warehouse, and barge for concrete products. 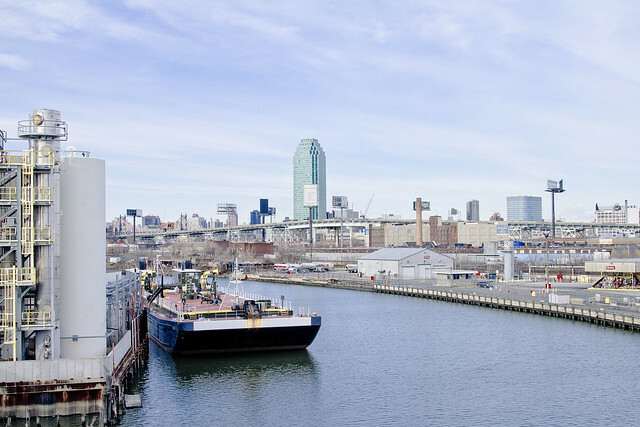 Now promise me, if the Newtown Creek asks, tell her I was with you- ok? 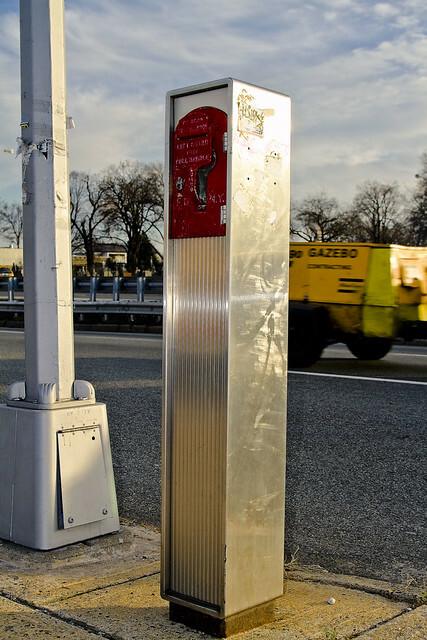 Sleek, styled, and svelte- witness the sentinel which stands at the corner of Astoria Boulevard and 70th street here in noble Astoria. 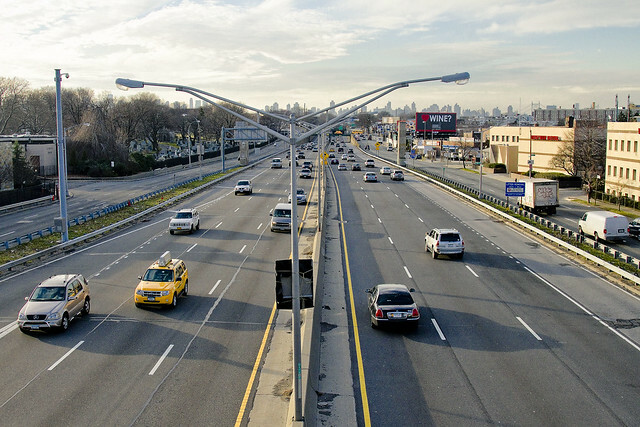 The Grand Central Parkway was driven into the land here by Robert Moses, sundering a long ago Dutch village called Astoria into distinctly differing sections. On one side of the road is St. Michael’s Cemetery- with row and apartment houses stretching out beyond its southern gates. To the north, a residential neighborhood is surrounded by highways, trains, and industrial concerns- but whether itinerant workman or long time resident, all may find succor at the silvery side of this guardian of the public trust. 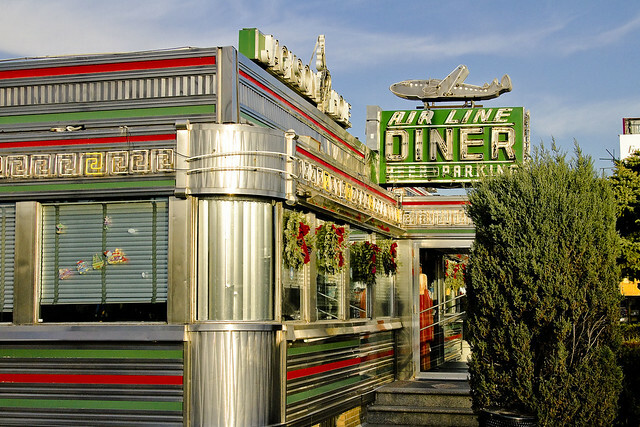 Hardly breaking news, but when wandering around the other day, I came across the famous Jackson Hole Airline Diner which had a brief appearance in the classic 1990 film “Goodfellas”. Here amongst the blessed hills of Astoria, we make it a point of acknowledging when one of our own gets famous, and you don’t get more famous than appearing in a Scorcese film. Worth a shot or two, thought your humble narrator. The ‘Idlewild Airport’ scenes used the cargo buildings of Kennedy Airport. 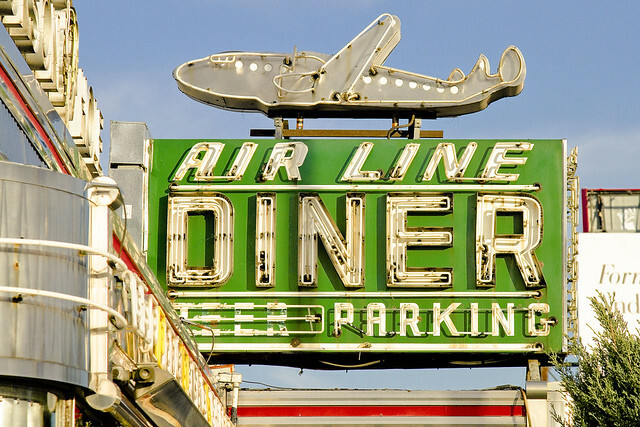 Idlewild became Kennedy Airport in 1963, but it’s near to New York’s other main airport, LaGuardia, that you’ll find the ‘Airline Diner’, where the grown-up Hill (Ray Liotta) and pal Tommy DeVito (Joe Pesci) steal a truck. It’s now part of the Jackson Hole franchise. Confusingly, but thankfully, it keeps the famous old neon ‘Airline’ sign. You can grab a burger in the classic pink and chrome interior of the Jackson Hole Diner, 69-35 Astoria Boulevard at 70th Street in Queens (tel: 718.204.7070). I’ve only eaten here once, and that was after a funeral, so can’t really say how the food is. The star of the show in this place is the neon signage and supremely modern design, if modern is still considered something that was in vogue 40-50 years ago. Relicts like this always remind me how remarkably dynamic the culture of urban and industrial design once was, and how static it has became today. Think about it, this sign is probably older than you are, but still looks modern. So little has actually changed in the last half century, from the fundamentals point of view. Sure, the technology has advanced but we’re still driving cars which a driver from 1972 would instantly know how to operate. It may be playing on your phone, but it’s still “I Love Lucy” you’re watching. There’s a new Superman movie coming out this year, a character which was first introduced to an audience in 1938- 74 years ago. 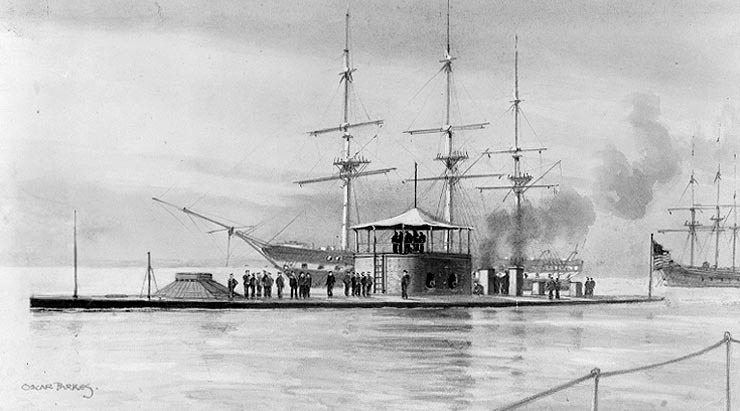 Also, this coming weekend there will be a huge celebration going on in Greenpoint at the Monitor Museum as they celebrate the 150th anniversary of the launching of America’s first ironclad. Check out http://www.greenpointmonitormuseum.org/ for details on the parties, parades, and other events they’re offering. I’ll be around, see you there. One would imagine multiple generations inhabited this place, celebrating dozens of birthdays and decorating scores of Christmas Trees. It’s only been a decade or so that I’ve been consciously watching this moose of a house sit abandoned, its windows gathering evidence on the actions of small boys, and it’s yard producing thousands of feral cats. 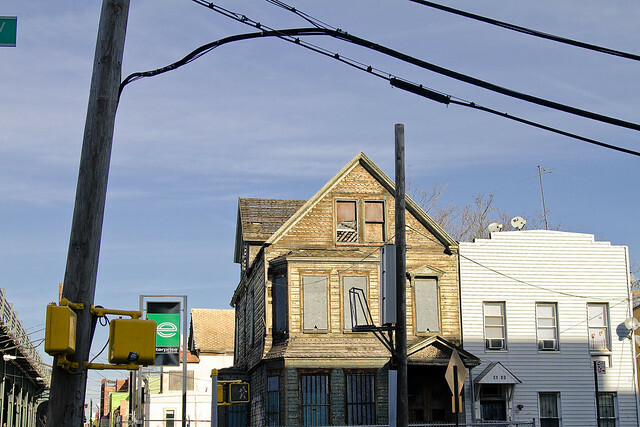 There are several of these large homes sitting shuttered in a cluster on 31st Street and 37th avenue here at the borders of Astoria and Dutch Kills, so one would assume that the amalgamated combination of them will form the footprint of some ambitious real estate project in the future. This house, this “shunned house”, just breaks my heart. Astoria’s “Ghost House” at 31-01 37th Ave.
Amongst the few friends your humble narrator has managed to acquire, one or two are Astoria natives who feel similarly about this house, but shrug their shoulders while pointing out sagging wooden beams and bulging walls. Speaking with certain authority, a sturdy Croat who has some familiarity with the arts of home construction and carpentry opined to me that it would be cost a small fortune to restore the place just to “livable status” let alone to restore lost glories. 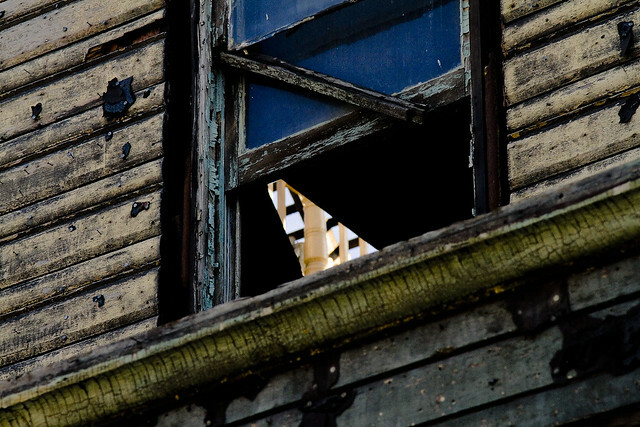 He suggests harvesting anything “made of old wood” within that has value, followed by a tear down and new construction. 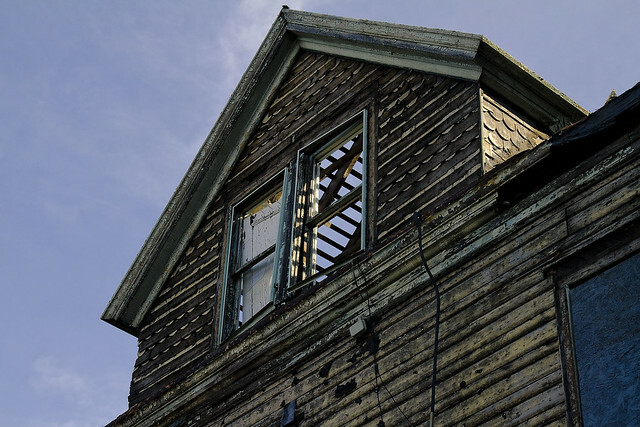 A year or two ago, the roof was removed at this “shunned house”. I’m hardly the first person to mention this house, of course (it’s even been featured briefly in other posts here at Newtown Pentacle). 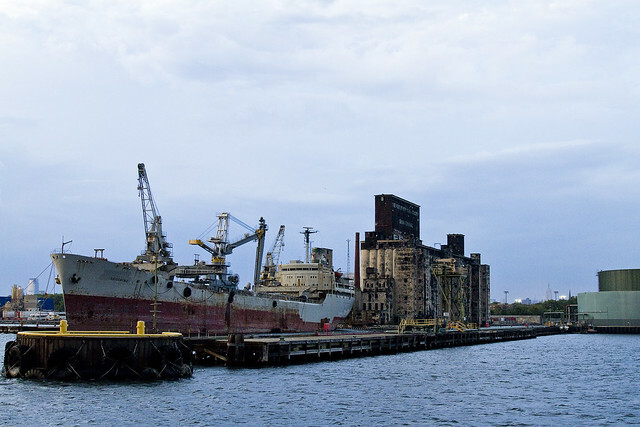 Scouting-NY and Forgotten-NY have featured the enigmatic wooden structure before. Area wags speculate on its fate, and tell me that the abandonment of the structure might be as long as two decades. Anybody out there have information on the place, and is it, as Scout suggests, a “ghost house” or has it merely been shunned? 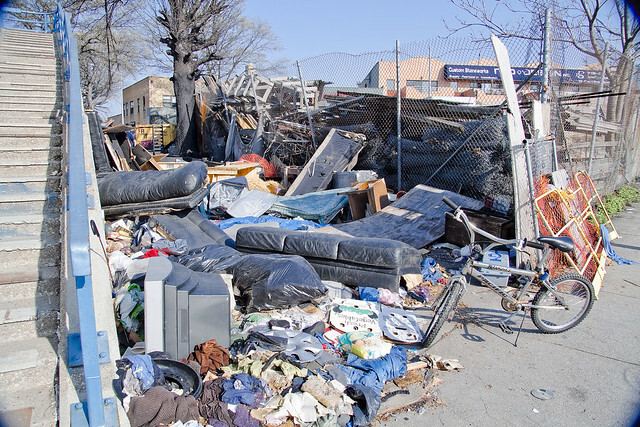 Often have I mentioned to you, Lords and Ladies of Newtown, that illegal dumping is a bit of an art form here in Western Queens. As the solitary wanderings around the neighborhood often carry me along distaff and seldom walked streets, the majestic compositions of refuse I observe are staggering. 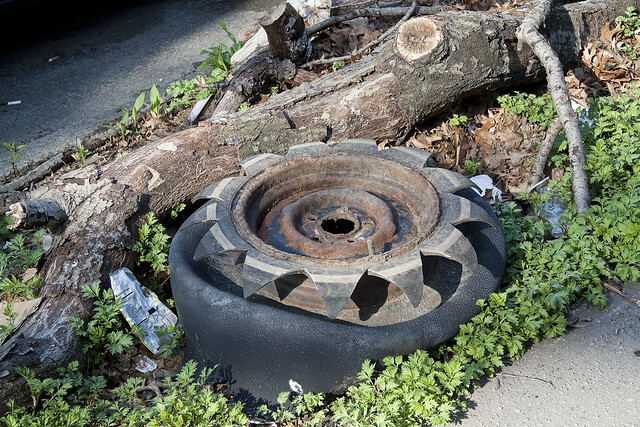 To wit, the tire and rim above was found along the nameless local street which follows the Brooklyn Queens Expressway between 46th and 49th street in Astoria. Nearby, what must be an entire apartment’s worth of goods, arranged indelicately amidst another nameless spot defined by Astoria Blvd. South, the BQE, and 48th street. A youth of indeterminate status was picking into the mass, searching for discarded treasures. Notice the large television near the stairs, and the expensive leather furniture. He didn’t care about these items, and was actually looking for video game cartridges or jewelry. Astoria kids grow up fast, and wise to the world. Such is the lot of things, of course, dust to dust and all that. Old Astoria, where public housing abuts multi million dollar mansions, sewer plants, power stations, and a magnificent park- this scene was captured at the corner of Main Avenue and Astoria Blvd., where an odd concentration of manufactured goods lay abandoned and unnoticed. Your humble narrator is sometimes guilty of casual littering, but as “Woodsy Owl” instructed me in youth- it’s “my garbage” so I should dispose of waste in proper receptacles and will often carry trash for blocks looking for a public basket. 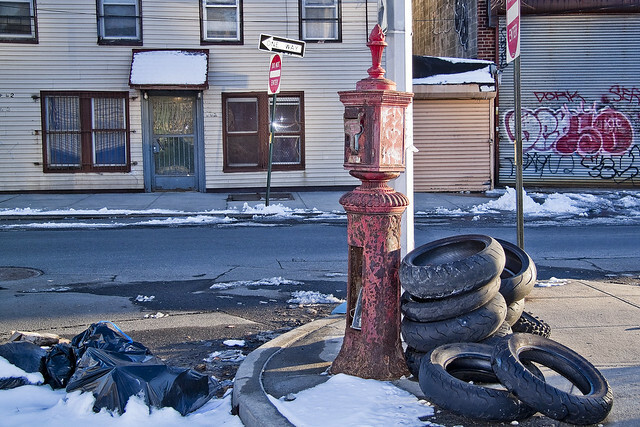 Of course, what are you supposed to do with used tires, or an entire apartment of stuff in New York City? What color bag are you supposed to put them in?